Most casual sports fans only pay attention to track and field when the Olympics roll around, and we’ve still got two more years until the 2020 Summer Olympics in Tokyo. However, we think you’ll be pretty impressed with Cuban long jumper Juan Miguel Echevarria, Olympics or not. Echevarria is just 19 years old. He’s currently in the middle of his second season as a pro competing on the IAAF circuit. But I wouldn’t call him an emerging star anymore. This dude is fully emerged and dominating. 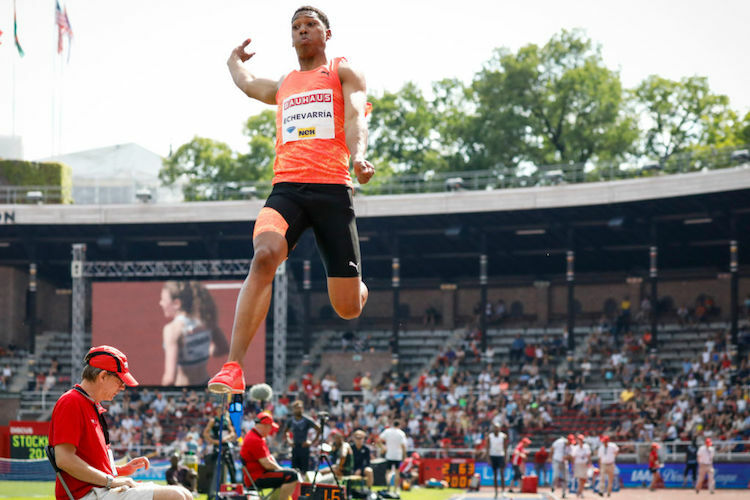 After finishing 15th in the long jump at the IAAF World Championships last August, Echevarria won the 2018 IAAF World Indoor Championships this past March. And over the weekend, at the IAAF Diamond League event in Stockholm, Echevarria absolutely annihilated the competition. In the finals of the men’s long jump, Echevarria jumped an insane 8.83 meters, or 28.97 feet. It was the longest jump anyone has seen since 1995, three years before he was born. And while it was aided by a tail wind of 2.1 meters per second—which means it’s not eligible for any records—it still beat every other competitor by almost a foot and a half. See, we told you you’d be impressed. Now all you have to do is remember the name Juan Miguel Echevarria and you can impress all your friends with your track and field knowledge when the Olympics finally roll around.